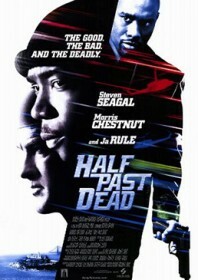 Another Seagal film in which he stars alongside a rapper as a way of boosting his mainstream credibility. It was DMX in Exit Wounds, now it’s Ja Rule’s turn to feel the stifling burden of acting with the stoic Seagal. The chemistry is about as enticing as a broken swing. It’s hard to decipher who comes out of this worse: the stocky, tired Seagal or his unfortunate co-star. They play best buddies, supposedly. Seagal is Sasha (“Yeah, I’m Russian, you got a problem with that?”) and Ja Rule is Nick (“Man, you’re whiter than I thought.”). They do time in an Alcatraz replica when the Feds catch up with their illegal shenanigans. Morris Chestnut plays a money-grabbing vigilante whose stylish team of heavily-armed, leather-clad Matrix thieves storm the island and demand to know the whereabouts of a hidden stash of neglected gold. The movie now enters Under Siege territory as Seagal assembles the inmates into a renegade SWAT team to take down the other criminals. The script is derivative and the action scenes are tiresome. Seagal, who used to relish well-crafted fisticuffs in his heyday, now looks as bored as the audience, and no hip hop soundtrack or frantic editing can even begin to compensate.